There are most definitely iconic vintage bridal looks: Grace Kelly, Princess Diana, Jackie O, Bianca Jagger, Priscilla Presley, and Brigitte Bardot in pretty much every film she appeared in, just to name a few. 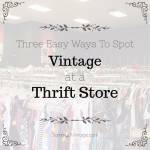 But what about those certain vintage brides—whether they are actual brides or cinematic—that don’t quite get enough credit? 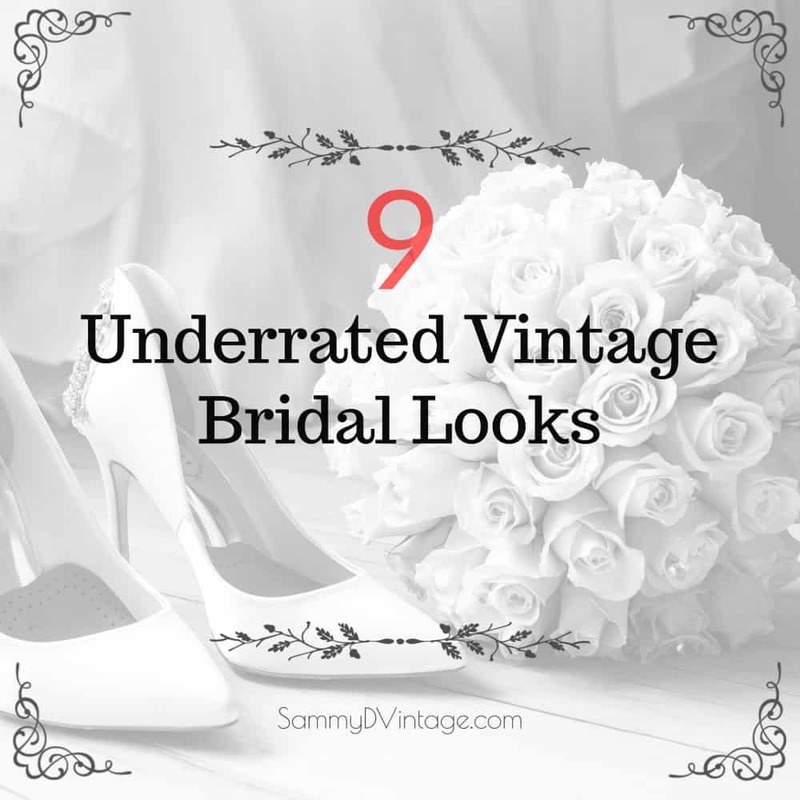 Take a look at this list of the unsung, yet simply extraordinary, vintage bridal looks. 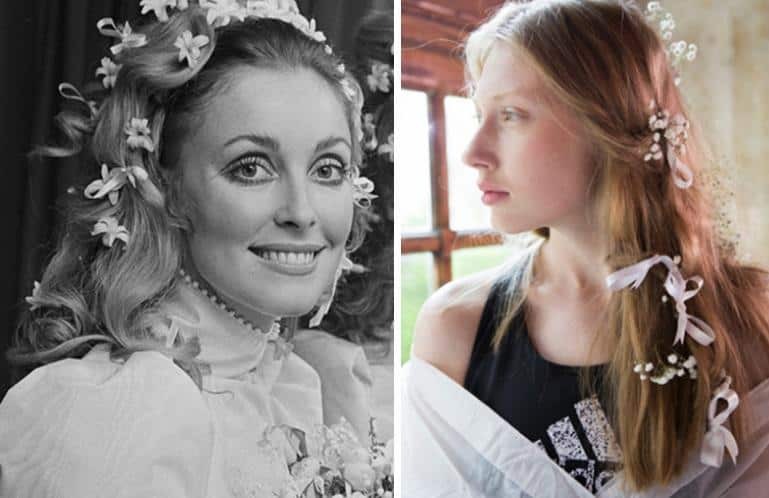 Sharon Tate’s bridal look doesn’t get the recognition that it truly deserves. The 1968 mod-inspired style was absolutely darling, from those puffed princess sleeves all the way down to her sweet little heels. 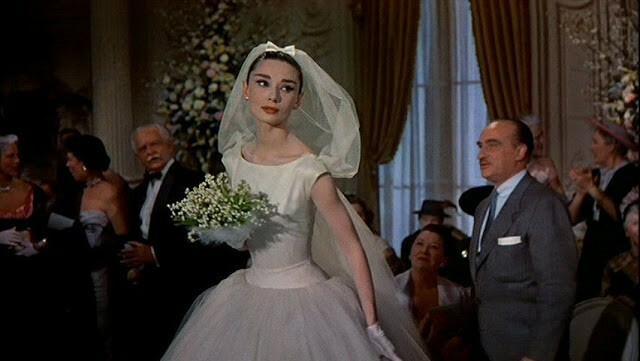 It’s true that Audrey’s tea-length wedding dress from 1957’s Funny Face does often get a lot of credit. After all, designed by Givenchy and worn beautifully by the iconic star, how could it not? However, what is often ignored is her to-die-for veil that accessorizes the dress. The veil is a style all its own, that is rarely seen in real life: bustled and gathered, yet descending all the way down her back, and past the dress hemline. And to top it all off, a lovely miniature bow. The effect is both dramatic and romantic, and very sweet—yet we never see veils like this. 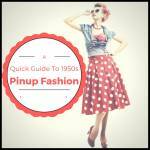 Perhaps it’s finally time for this style to be seen everywhere. 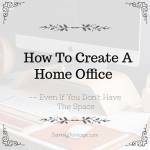 You can get your own here. 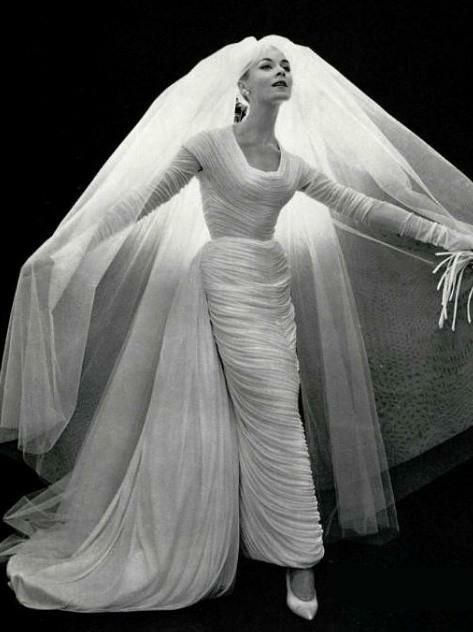 Quite a different bridal look from 1957 than Funny Face, this Nina Ricci draped silk jersey creation is nothing short of dreamy. The highly-texturized fabric, the simple scooped neckline, the flowing bustle, and the waltz-length veil all come together to create a terrifically gorgeous bridal look, both ethereal and incredibly chic—two things that usually don’t go together. In the 1960s and 70s, Jane Birkin was the queen of effortless chic—and this bridal look from 1968 is no exception. Her no-fuss white crochet dress, with the simple accessories of a dainty necklace and a flower crown, is timelessly stylish. Adding to the tone of this look are her bare feet and everyday hair. A bohemian dream. The reason this look rarely gets mentioned is most likely because it’s unclear if it was meant to be a wedding dress. 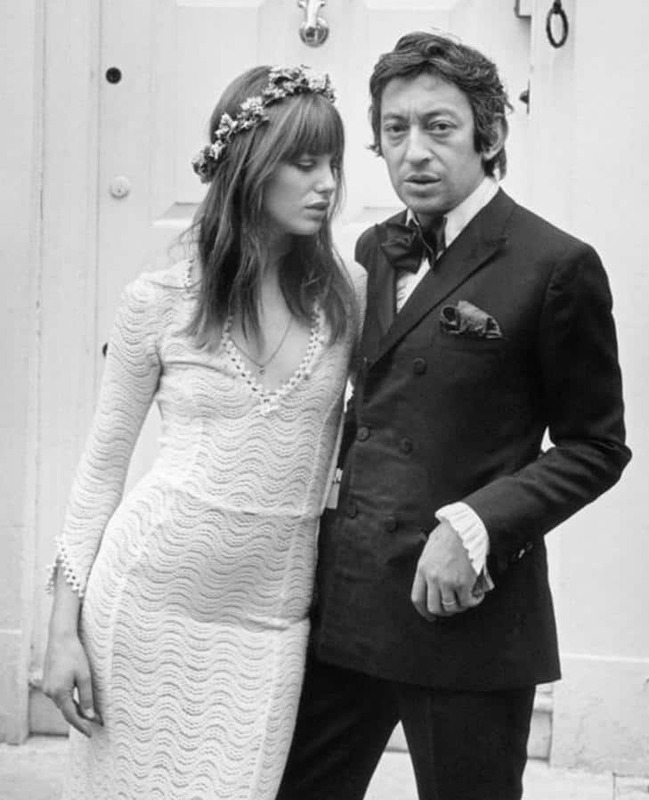 Whether Jane was actually getting married to Serge in this dress is unclear, and so it often gets ignored. Whatever the circumstances were, it still makes a delicious bridal look! Of course the only woman James Bond ever married has to have a unique bridal style! In On Her Majesty’s Secret Service, Tracy Bond marries James wearing an amazing wedding jumpsuit designed by Marjory Cornelius. Another design that was most likely very inspired by the mod style of the 1960s, this jumpsuit features skin-showing cutouts dotted with white flowers and was paired with a floor-length robe that softened the entire look with its romantic layers and femininity. Although this look was created for the film in 1969, bridal jumpsuits are still going strong. As recently as 2019, white wedding jumpsuits have been gracing the runways at couture bridal shows. Elizabeth Taylor got married a lot, and some of her dresses were perfect. One of her better choices was this bright yellow chiffon babydoll dress from 1964. Brides these days tend to be shy of colorful dresses, especially when paired with a dramatic hairstyle like Elizabeth’s here. However, this look is completely underrated. Elizabeth evokes purity and style with this look. Choosing to weave hyacinths and lilies of the valley into a complex braided hairstyle, Elizabeth appeared to be a springtime goddess in this ensemble. The round neckline and bow across the waist only adds to the sweetness of this wedding dress. It also echoed her character in Cleopatra, as it was designed by the film’s costume designer, Irene Sharaff—who apparently loved her in yellow and flowers. 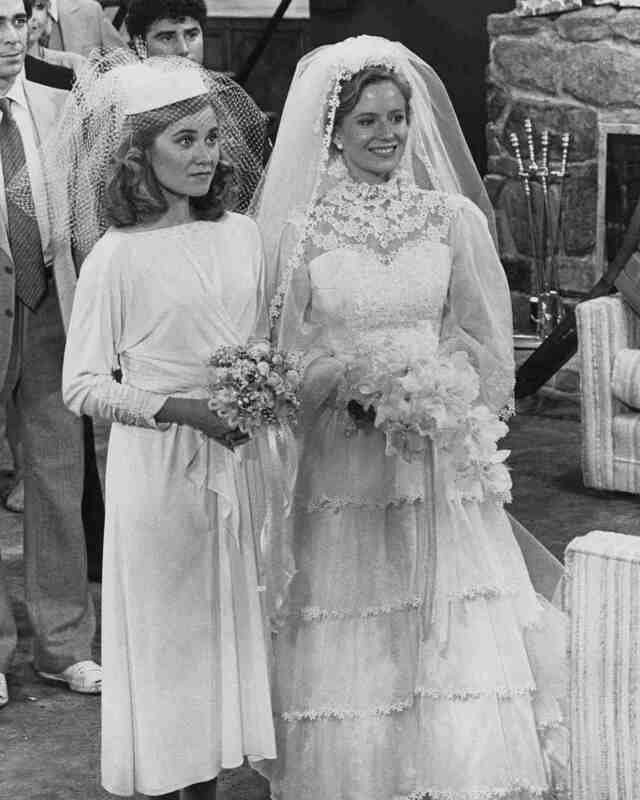 In the 1981 TV movie The Brady Girls Get Married, Marcia and Jan have a double wedding. The sisters wear two very different wedding gown styles, and it’s Marcia’s that really steals the show. This rarely-spoken-of bridal look is unique and cute as can be. As Marcia herself says, it’s “silk crepe de chine, with a little silk hat and a short veil. Really modern! 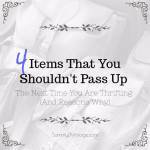 It’s the newest fashion.” While it may no longer be the newest fashion, it certainly is striking, and very pretty. 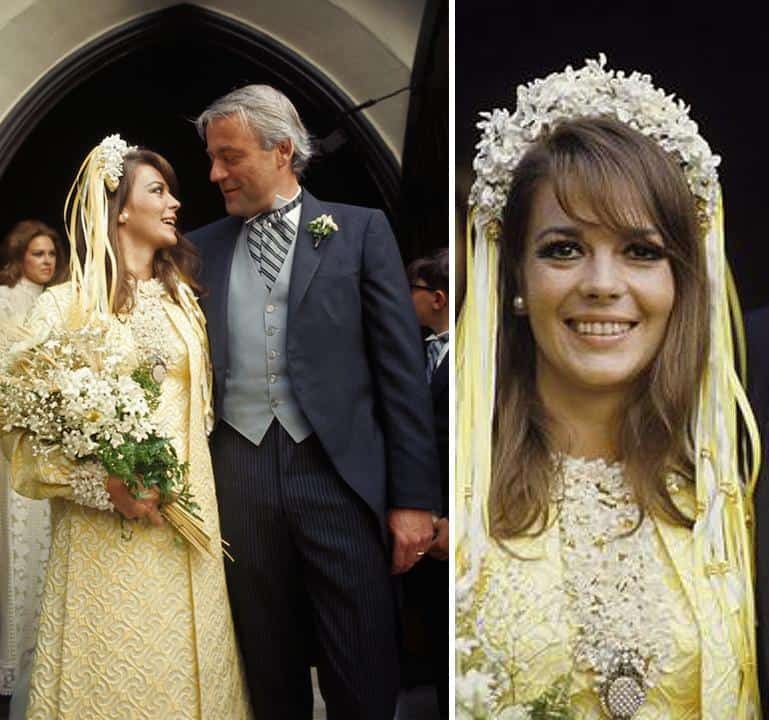 Perhaps one of the reasons that Natalie Wood doesn’t get much credit for her remarkable bridal looks is because she so often landed on the “worst dressed” lists of her day. However, she really knew what she was doing when it came to her wedding style. 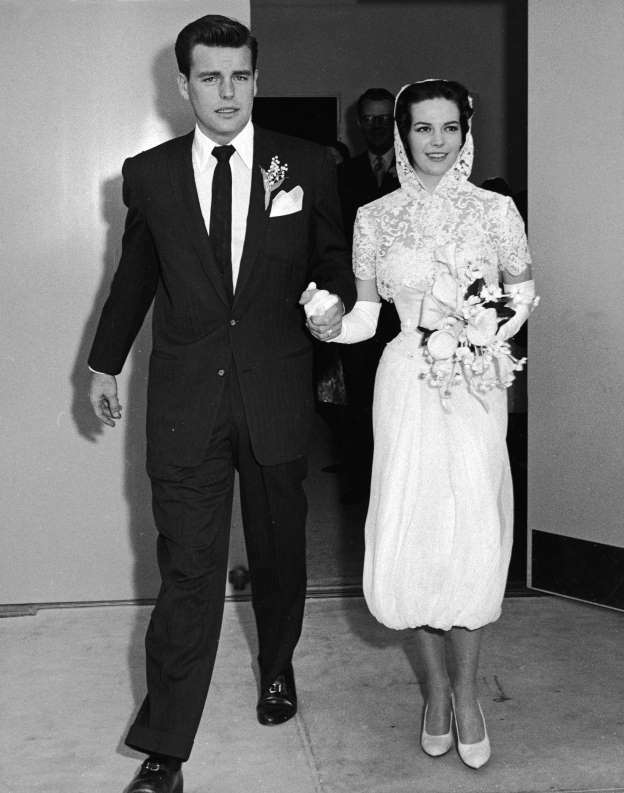 When she married Robert Wagner in 1957, Natalie looked chic as can be in a face-framing lace hood, white calf-length dress which bunched at the hem, opera gloves, and ballet flats. Any of these elements might look odd if combined with the wrong thing, but when they were put together, true bridal magic happened. Natalie made a gorgeous bride, in great part thanks to this stunning ensemble. Years later in 1969 when Natalie married Richard Gregson, she looked equally incredible. 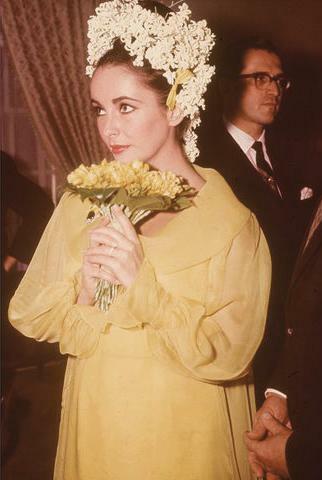 This time, she went with a “yellow” theme and chose a yellow dress, a yellow headpiece, and a yellow floral bouquet. The dress is lovely, but the true underrated standout here is Natalie’s playful ribbon “veil”. The unique design caters to Natalie’s youth, but is also quite adult when paired with a conservative dress like Natalie’s. If this bridal ribbon headband were widely available today, it would be very in demand. 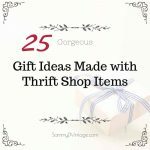 There you have it: wonderful, unique, sweet, and stylish bridal looks that simply don’t get mentioned enough. From jumpsuits to Jane Birkin, from flower crowns to Funny Face, these styles are imaginative and rare. Which would you choose for your own wedding?